November'sLeonid meteor shower may have passed us by, but that doesn?t mean therearen't anygood meteor displays to look forward to as the end of 2010 draws near.In fact,one of the best is just around the corner, scheduled to reach its peaknextweek: the Geminid meteor shower. TheGeminidsget their name from the constellation of Gemini, the Twins, where thedisplayof so-called "shooting stars" appears to originate from the nightsky. During the overnight hours of Dec. 13 and Dec. 14, thenight of thisshower?s peak, the meteors should appear to emanate from a spot in thesky nearthe bright star Castor in Gemini. 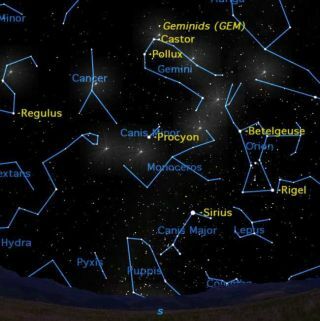 Thissky map shows where to look for the Geminid meteor showerwhen it peaks onDec. 13 and Dec. 14. TheGeminid meteors are ? for those willing to brave the chill of aDecember night ?a fine winter shower, and usually the most satisfying of all the annualshowers.They can even surpass the famous Perseid meteors of August at theirpeak. Studiesof past displays show that this shower has a reputation for being richin slow,bright, graceful meteors and fireballs as well as faint meteors, withrelatively fewer objects of medium brightness. Many appearyellowish in hue.Some even seem to form jagged or dividedpaths. Accordingto the late meteor specialist Neil Bone, at 2 grams per cubiccentimeter (0.07pounds per cubic inch) on average, Geminid meteoroids are several timesdenserthan the cometary dust flakes that supply most meteor showers. Add thisto therelatively slow speed with which Geminids typically encounter Earth ?about 22miles (35 km) per second ? about half the speed of a Leonidmeteor, and you have a recipe for meteors that linger a bitlonger in view thanmost. TheEarth moves quickly through this meteor stream. The rate ofmeteors increasessteadily for two or three days before maximum, reaching roughly above aquarterof its peak strength, then drops off sharply, lasting foronly about a dayafterward. Thoselate Geminids, however, tend to be especially bright. A few renegadeforerunners and late stragglers might be seen for a week or more beforeandafter the peak night. One interesting finding made recently from videoanalysisby the International Meteor Organization was that Geminids have beendetectedas early as Nov. 30 ? totally unexpected from past visualobservations. TheGeminids usually perform splendidly every year, although as was thecase forlast month?s Leonids, the moon is going to pose a bit of a problem thistime.In fact, the moon will reach first quarter phase on Dec. 13, the samenight asthe Geminidpeak, shining brightly in the dim constellation of Pisces,the Fishes. Thatmeans that many of the fainter Geminid streaks will likely be washedout by thebright moonlight. Butunlike the Leonids, where the moon was brightly illuminating the skymost ofthe night, in the case of the Geminids the moon will be setting around12:30a.m. (your local time) early on Tuesday, Dec. 14. That meansthat the sky willbe dark and moonless for the balance of the night, making for perfectviewingconditions for the shower. Inaddition, according to Margaret Campbell-Brown and Peter Brown in the2010Observer?s Handbook of the Royal Astronomical Society of Canada, peakactivityis projected to occur at or near 6 a.m. EST on Dec. 14. Undernormal conditions on the night of maximum activity, with ideal dark-skyconditions, at least 60 to 120 Geminid meteors can be expected to burstacrossthe sky every hour on average (light pollution greatly cuts thesenumbers). So,in 2010, along with a lack of significant moonlight, North Americansareprojected to be the best situated to catch the very crest of theshower, whenthe hourly rates conceivably could exceed 120! Britishmeteor astronomer Alastair McBeath also points out that a new detailedanalysisconfirms that Geminid near-peak activity is very persistent with hourlyratesof around 80 to 130 often seen for almost a day around the predictedtime ofmaximum, corresponding this year from about 1900 UT on Dec. 13 to 1600UT onDec. 14. So from virtually anywhere on Earth, an excellentGeminid show can beanticipated. Aproductive Geminid watch can actually begin as early as 10 p.m. localtime,because the shower?s radiant (where the meteors appear to originatefrom) isalready fairly high in the eastern sky by then. Even with thatannoyinglybright moon still high in the western sky, it will be worth watchingfor someearly "Gems." Butkeep this in mind: At thistime of year, meteorwatching can be a long, cold business. You wait and you wait formeteors toappear. When they don't appear right away, and if you're cold anduncomfortable, you're not going to be looking for meteors for verylong.Therefore, make sure you're warm and comfortable. Warmcocoa or coffee brought along in a thermos can take the edgeoff the chill, as well as provide a slight stimulus. It's even betterif youcan observe with friends. That way, you can keep each other awake, aswell ascover more sky. Giveyour eyes time to adapt to the dark before starting. TheGeminids will be especially noticeable right after the moon sets, astheirradiant point will be passing nearly overhead. The higher ashower?s radiant,the more meteors it produces all over the sky. Thetrack of each meteor does not necessarily begin near Castor, or even intheconstellation Gemini, but it always turns out that the path of aGeminidextended backward along the direction of flight passes through a tinyregion ofsky about 0.2 degrees in diameter (an effect of perspective). Inapparent size,that?s less than half the width of the moon. Assuch, this is a rather sharply defined radiant as meteor showers go,suggestingthe stream is "young" ? perhaps only several thousand years old. Geminidsstand apart from the other meteor showers in that they seem to havebeenspawned not by a comet, but by 3200Phaeton, an Earth-crossing asteroid. Then again, the Geminidsmay be cometdebris after all, for some astronomers consider Phaeton to be the deadnucleusof a burned-out comet that somehow got trapped into an unusually tightorbit.